← How do you trust after a divorce? Dating after Divorce: Why should you wait? This entry was tagged #TheLoft, Do the Next Thing, Elisabeth Elliot, Hub Pages, Practical advice. Bookmark the permalink. Great reads! I liked your article on moving, since we’ve moved two years in a row. The freezer meals are a great idea–we also make a freezer meal for the day we get back from vacation. Neat post! I don’t think you copped out at all. The articles you linked to are important ones for those in those situations. Thank you! And Thank you for joining us at The Loft. Thanks Leah, I appreciate that. I have really enjoyed The Loft. I am looking forward to reading through some of the articles you’ve shared – thank you! 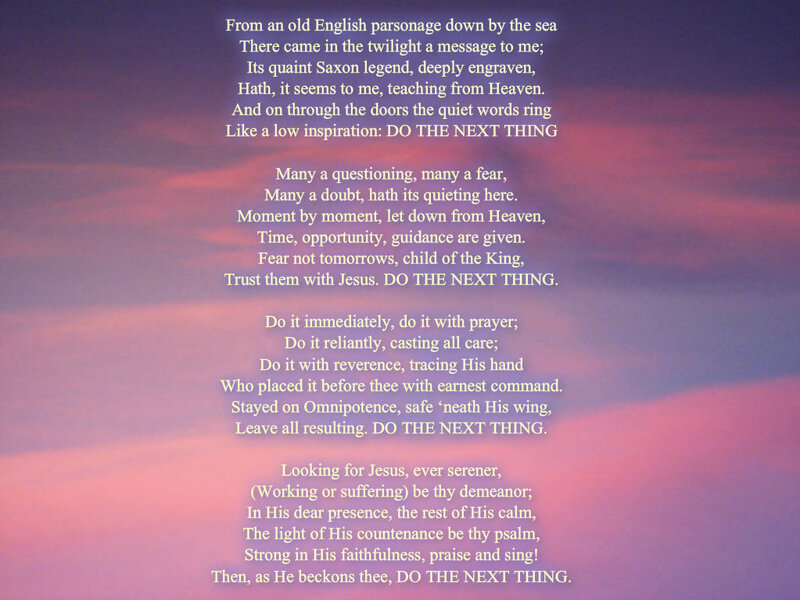 “Do the next thing”…it seems so simple, but I know for me, it’s often the one thing that I don’t do as well. I feel I’m often looking ahead to the next “big thing” but I’m forgetting to do the very next thing (or I skip it because it seems trivial). This is a great reminder for me, thank you!